SAMSUNG Galaxy A6 and Galaxy A6+ announced with Infinity Display and Android Oreo. Samsung Electronics today announced the Galaxy A6 and Galaxy A6+ smartphones with an advanced camera and stylish design. Featuring a powerful front and rear camera, a sleek premium design and Samsung's signature Infinity Display, the new Galaxy A series is available in four stylish colors; Black, Gold, Blue and Lavender. The Galaxy A6 comes with a 5.6-inch HD+ Super AMOLED display, while the Galaxy A6+ will feature a larger 6.0-inch FHD+ Super AMOLED display - both featuring the Samsung's signature Infinity Display design with 18.5:9 screen ratio. Both devices make multitasking fast and easy with App Pair, fully utilizing the Galaxy A6 and A6+'s large ergonomic screens by allowing users to pair two apps, halving time and doubling enjoyment. With the Always on Display users can get information at a glance without unlocking their phone, saving on time and battery life. The Galaxy A6 and A6+ operates on Android 8.0 Oreo and they will get 1.6GHz octa-core and 1.8GHz octa-core SoC, respectively. Both the phones come in 3GB RAM + 32GB internal storage, and 4GB RAM + 64GB inbuilt storage options, and support microSD cards of up to 256GB capacities. The Galaxy A6 sports a single 16MP AF rear camera (F1.7) and a 16MP FF front camera (F1.9). The Galaxy A6+ features a dual rear camera setup with a 16MP primary sensor, 5MP secondary sensor and a 24MP FF front camera. 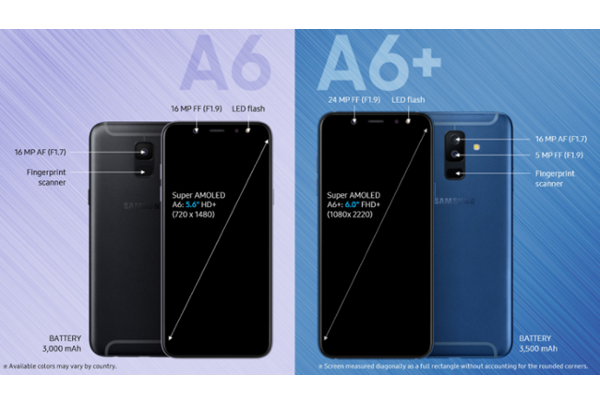 A 3000mAh battery will power the Galaxy A6's internals, while the Galaxy A6+ will get a larger 3500mAh unit. With the Galaxy A6 and A6+'s powerful front and rear camera, taking beautiful shots or selfies anytime, anywhere has never been easier. Featuring an adjustable front LED flash, Galaxy A6 and A6+ users can snap stylish selfies, from day to night. And with the rear camera's low-aperture lenses, users can also capture sharp, clear photos in low light conditions, without sacrificing image quality no matter what time of day. The Galaxy A6+'s Dual Camera can even further enhance the pictures and moments that matter with Live Focus mode, meaning that users can control the depth of field and bokeh effect before or even after the shot is taken. The Galaxy A6 and A6+ integrates several popular features including hassle-free security with Face Recognition and Fingerprint scanning for a quick and effortless way to unlock the device. The Galaxy A6 and A6+ also support Bixby Vision, Home and Reminder. Samsung's Bixby can assist users in completing a range of everyday tasks. With Samsung Pay included, users will always have their wallet to hand. Supporting Near Field Communication (NFC), the Galaxy A6 and A6+ can be used virtually anywhere you can tap your credit or debit card. Users can experience a richer surround sound experience to enjoy movies, music and more with speakers supported by Dolby Atmos optimized audio. Users can choose to turn on the Dolby Atmos effect to transform their audio with breathtaking moving sound that flows around them.